Santa Claus is coming to Prineville this Saturday, and he needs all the little boys and girls to help him in his workshop. He will be at the Carey Foster Hall for Santa's Workshop from 11 a.m. to 3 p.m. Saturday, Nov. 17. 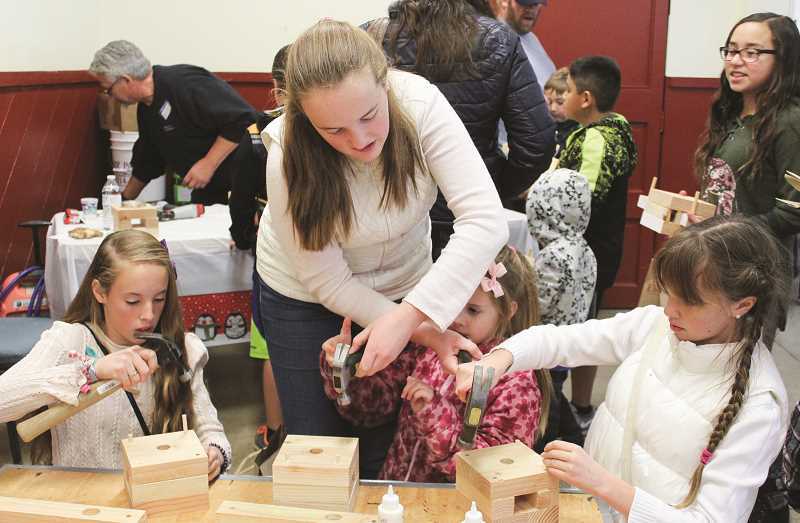 The annual Crook County Parks and Recreation District event gives children an opportunity to create and make crafts for their loved ones for Christmas, said Recreation Coordinator Eli Tomlinson. Santa's Workshop is open to all ages, but crafts are catered to kids from age 3 to 13. Admission is $5 per child. Children and their parents can visit as many as 21 project booths. "The crafts will range from beaded and leather projects to Christmas cards and picture frames," Tomlinson said. "Melanie Marlow, from Shasta Leatherworks, will also be there leading a booth and helping kids make stamped leather items." The wood project this year is a napkin holder that the kids will be able to build and paint for a family member. Older siblings or adults must stay with their children, and they must dress appropriately as the kids will be painting and crafting. Children can make as many gifts as time and energy allow. Each project is limited to one per child. Various companies and individuals have donated the materials for the crafts over the years. If Parks and Rec needs more supplies, they purchase from other online retailers. Adult volunteers as well as students from the middle and high school Honor Society clubs will run the booths. "We are always looking for more adult volunteers to help coordinate the booths and help lead the middle and high school volunteers," Tomlinson said. Santa's elves will be on hand to take Polaroid photos of children with Santa. The photo is included with the price of admission. Last year, about 320 kids visited Santa's Workshop, and organizers are planning for at least that number, if not more, this season. Members of the local Lions Club will have food available to purchase between 11:30 a.m. and 2 p.m. the day of the event, including hot dogs, chips, drinks and hamburgers. "This is a great event that allows families from all backgrounds and diversities to come together and do something that is purely for the kids," Tomlinson said. "It also allows the kids to craft and make a mess without parents needing to clean up after." Place: Carey Foster Hall at the Crook County Fairgrounds, 1280 N. Main St.
To volunteer, call Eli Tomlinson, 541-447-1209.